How I Went from Yo-Yoing to 33lbs Down! 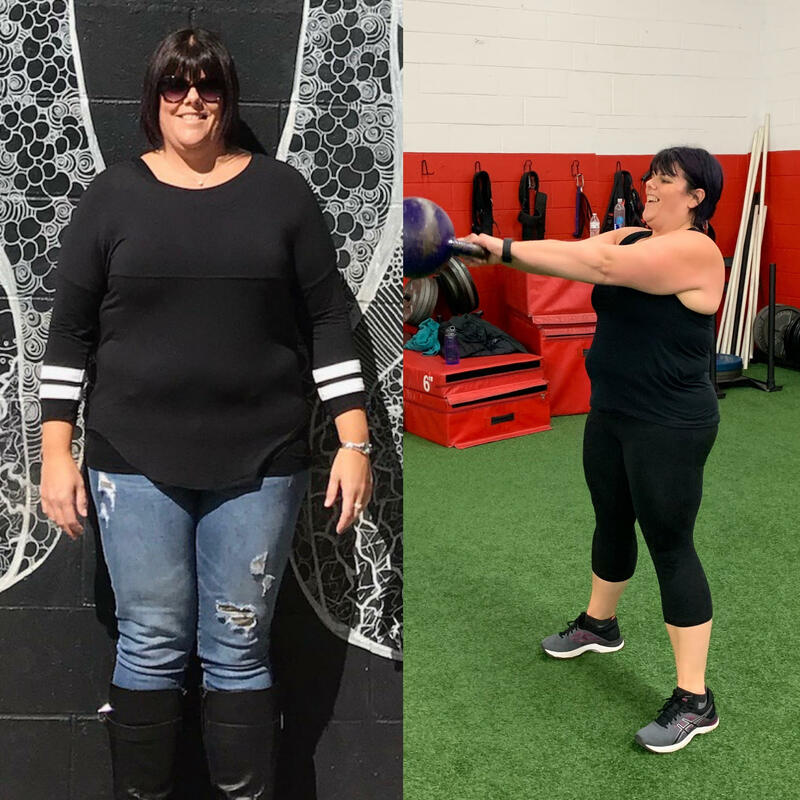 Before DSC, I had previously joined several gyms, looking for a place where I would be comfortable and motivated at to reach my health and fitness goals. I found that I was able to stick with cardio classes but was starting to feel stuck and bored with the limited routine. I ate pretty well and could always lose 15-20lbs when I was really focused on "dialing it in" and working on it. Eventually though, I would slack and gain back all the weight... and then some. When I joined DSC, I wanted to gain muscle, have more strength, feel better and of course lose some weight! Sticking with a training program was something I was nervous about but excited to try. The struggle is always real with me. I find that I can go all out when things are different, new and exciting but then I never really stick with it. My old habits will kick back in, I will have no accountability and then before I know it I am right back where I started. I knew that I needed to stop dieting and make a true life style change or I would always find myself in this never-ending circle. I was ready to stop the yo-yoing. So, I knew that I needed to commit to improving my health for real this time and I knew that I would need help to do it because trying it on my own like every other time in the past did not work. I decided to join the Women’s Group at Dynamic! I remember talking to Sara at the Front Desk before getting started and then when I showed up for my first night of classes. She is the best! Naturally I was nervous on my first day, but she made me feel incredibly welcomed and offered me great support! The class itself was great! Renee and the other coaches were very helpful and supportive. They showed me how to do all of the exercises and made sure I was working at an appropriate pace! I am proud to say that I have attended consistently now for over 6 months and then just in the last month, I moved to the Adult Co-Ed classes!! I actually love all the workouts, which is something I didn’t think I would EVER have said before DSC, but it's true! I feel stronger every day and I am doing things that I never imagined I was strong enough to do. My favorite exercises probably includes pushing sleds forward or backwards! All of the members at Dynamic support each other during the workouts and cheer for one another to succeed and push farther. My most favorite thing about training at DSC though is the support of all the coaches! You all ROCK! Each of them is there to help you when you need it, make sure you're doing things correctly and encouraging you throughout class! I was in my sixth month at DSC when I joined the Nutrition Coaching Program. I was happy to be in a consistent workout routine and enjoying working out, but I knew I still had to improve my eating to really reach my goals. Overall I found the Nutrition Program to be very helpful in figuring out what I could be doing to eat better and fuel my body! My Nutrition Coach Beth was responsive and supportive. Our private Nutrition Coaching Facebook page was the best! People with similar goals as mine shared in it and it brought a sense of community to the program. Everyone in the group was very encouraging and gave support not judgement. For me, the biggest things I noticed change in my daily habits were the consistency and amount of real, unprocessed foods I started to include into my diet on a daily basis. I started to feel great! My confidence, moods, and energy have improved drastically so that motivates me to continue this lifestyle, knowing that my body is feeling great! Since joining DSC Group Training and the Nutrition Coaching Program I've lost 33lbs! More than just my weight and the numbers on the scale, I’ve lost a lot of inches too! I would have never known this if the program didn't show us how to take our measurements and use them as a tool to gauge our progress! I lost 1 3/4" on my bicep, 1 1/2" on my chest and 1 1/16" on my waist. I don’t think I have ever lost so many inches and it shows because my clothes fit better and I know I have turned fat into muscle mass! Beth, thank you for all your help with the Nutrition Coaching Program. You were so motivating and helpful!! My advice would be just join... don’t be afraid because DSC is truly not just a gym but a family! They will help you every step of the way to reach your goals!